Many, many things have happened since I last blogged. We had another daughter, bought a house....lots of new changes that did not leave me much time....for crafting or blogging. 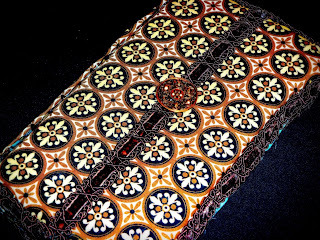 But, the dust has now settled and I cant wait to get back into all things crafty. I have crafted a bit here and there. And I have baked a few things. This is a cake I made for my daughter's birthday. 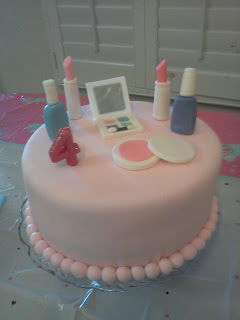 All the make-up is hand crafted from fondant. It was so much fun and she just loved it. I am so ready to get started crafting again and hope you will follow along. Now....to catch up on all things crafty. See you guys soon! Saturday was my oldest daughter's birthday. I offered to make her any kind of cake she wanted. She didnt want cake....she wanted a fruit tart. Good thing we live in California, where you can get just about any kind of fruit, anytime of year. I used this recipe from Paula Deen, and let me tell you, it was perfect! The crust is so buttery...more like a shortbread cookie than a pie crust. It was the perfect compliment to the slightly sweet, and very rich and creamy, cheesecake filling. I actually made two. One to share with our guests and one for the Birthday Girl to do with as she pleased. Lets just say we may, or may not, have a problem with our love of sweets and I wanted to be prepared for anything! And, by anything, I mean my oldest daughter and I splitting the entire second tart. Which may, or may not, have actually happened. I am a lady...I will never tell. I only had one tart pan so I baked the second crust in a pie plate and it turned out just fine. I didnt use the exact fruit the recipe calls for. I changed it up a bit, according to what my daughter likes and what looked fresh at the store that day. Okay....Okay....I know. This is the, like, 50th craft Ive done with my little circle punch. Let me just say, in my own defense, I am not a one trick pony. I do have other crafts that Im working on. Crafts that in no way involve the little circle punch. I promise. Its true! These magnets were actually an accident. I was sitting with Daughter #3, helping her make a garland for Valentines Day. She is 2 and LOVES to get crafty with Mama. So I had a lot of craft supplies out on the kid's table. Scrapbook paper, stickers, and my trusty circle punch...you know...just in case. You never know when you will need such a versatile tool. Daughter #4 was crawling through the kitchen at the time, headed for her favorite play area....the fridge. She loves all the magnets we have. An 8 month old is easily amused sometimes. Sometimes. Somehow, one of the boring grown up magnets got pushed down in to the fun magnet kid area, so I picked it up and....It hit me.....We need Valentine Magnets in this house! Cute little magnets in festive colors to hold lots of little love notes.... Hand written terms of endearment...Beautifully romantic letters of adoration. I used the circle punch to punch out a few circles from a free magnet used for advertisement. Not the first time I have used these for crafts. I also used them for my Gingerbread Invites. This particular one is for our local Mosquito Control Department. I honestly have no idea where I acquired this magnet Or why I would have it. I have never felt the need to call them..And I hope I never do. Especially now. Because their number is covered with scrapbook paper and stickers. Lucky for the mosquitos, I guess. After I punched out the magnet, I punched out some paper circles and glued them to the magnet and added a few foam stickers. Except the black one. He got a shot of spray paint because I didnt have any black paper. Sure. I could have put that cute little love bug on red or pink paper. But he deserved so much more. I really wanted him to stand out. Sometimes, you just gotta go the extra mile. And, in the end, Im glad I did. That black background is just the right amount of 'pop' against the stark white of my grocery list. I was really in the mood to make Valentine crafts but I didnt have the time, or spare cash, to run out and buy anything. So, I started digging through the craft stuff and found some clear glass rocks and red paint. Now, I know that these marble thingys are not actually called glass rocks. But I wanted to call them rocks because I needed a cute name for this post and "Love Marbles" did not sound nearly as cute as "Love Rocks". So, for this post, at least, rocks they are. I put little red blobs of paint on the back (flat side) of 18 of the rocks and let them dry. I gave a 5x7 picture frame a coat of the same red paint and let it dry, too. Then I arranged the rocks in a heart shape and, one by one, glued them to a piece of white card stock and put it in the frame. Not bad for a free craft. I mean, sure, I did buy the frame at the Dollar Store, like, 5 years ago and I also got the rocks there, but, since I had them on hand, I didnt spend any money to make this 3D beauty. Stay tuned to see the project Im working on to use the glass that I left out of this frame. I wanted to make a few more gifts for my cousin's shower, in addition to the fancy wipe cover and her cake (I plan on doing a post about the cake next week). 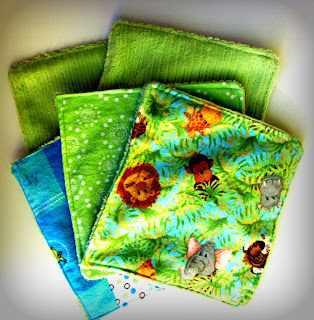 When I saw these super soft washcloths, I knew they would be perfect. 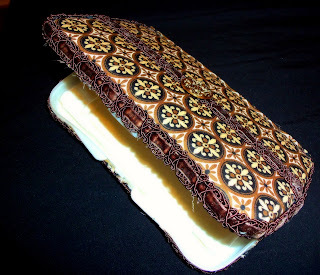 Kara, at Creations By Kara, has a great tutorial for the washcloths. I just cant believe I had never thought to make a washcloth out of softer fabric. It makes so much sense! Washcloths are never soft enough for my skin, let alone a newborn. And the baby washcloths you buy in the stores are so thin and flimsy. These are so thick and soft, perfect for a new baby. Or for yourself. I have 4 daughters so Im going to be making LOTS of them. They were so easy to make. They were also my first real sewing project. I was kinda nervous because I had not used my sewing machine yet. It was a gift for my birthday and I wanted to take a sewing class at JoAnns before I tried to make anything. But Kara made it look so easy that I actually made them first. ( I did take the class this past Wednesday, by the way, and it was great!) Check out her tutorial for the easy instructions. I just love the softness of them and I cant wait to make more for my girls . A big THANK YOU to Kara for such a great idea and for making it so simple. I have a Baby Shower to go to in a few weeks and I wanted to make something special. Something other than the standard onesies and receiving blankets. 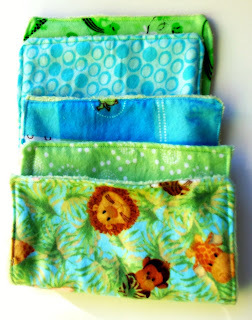 When I saw the tutorial over at Creative Mommas for their wipes cover, I knew it was perfect. For the details on how to make it, check out this tutorial. It is so easy and you can customize it for just about anyone. This is my version but I LOVE the one they made, too. 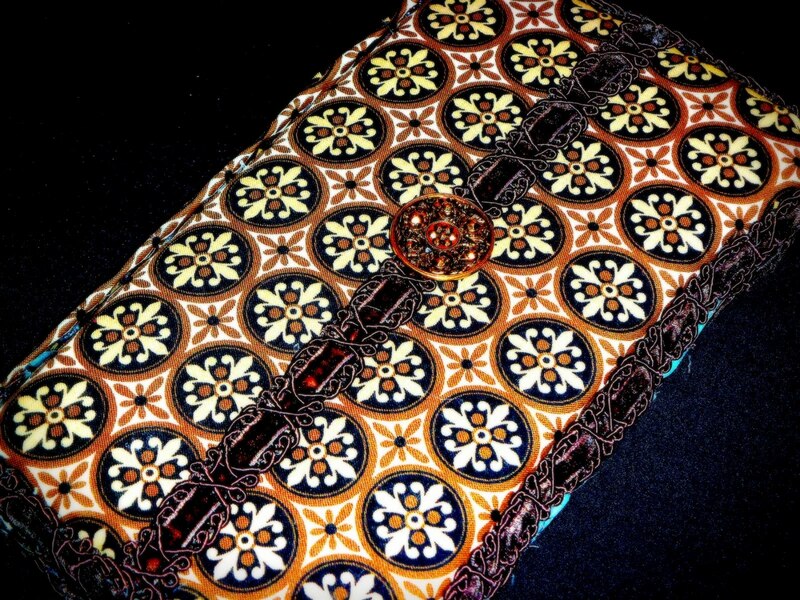 It makes something functional so very pretty. Now I want to make one for everyone I know! My candle holder project left me with a lot of little baby food jar lids. I kept them because....#1-I am a hoarder....and #2-I just knew if I kept staring at them long enough, I could find a good use for them. And I am fairly certain that this is what makes me a hoarder in the first place...everything can be used again, in another way, right? I like to think so. While staring at my ever growing collection of lids and wondering what to do with them, I realized that the little circle in the center was about the same size as my new circle craft punch. Could it be? Was it possible that I could squeeze yet 1 more craft from my $6 toy? I was giddy with excitement. Really....It doesnt take much, folks. I punched some scrapbook paper with my 1.5 inch craft punch and put alphabet stickers on the circles. I spray painted the lids and hot glued magnets on the back. Then I glued the circles in the center of the lid. And now you have a nice little set of alphabet magnets for your 2 year old to pull apart, shove under the fridge and carry on with their day, as if nothing ever happened. Enjoy! 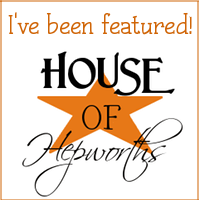 Blogs I Love . . .